The Mountain Deux is on hold for the summer of 2019. Please check back for further updates. Interested in helping organize future Mountain Deux events? Let us know! 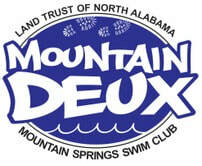 The Mountain Deux was an aquathlon (run/swim event) for all ages, hosted by the Land Trust of North Alabama and Mountain Springs Swim Club. The trail running portion of the Mountain Deux began at the Land Trust's historic Three Caves site, and continued on through various Land Trust trails. The swimming portion of the event was held in the saltwater pool at Mountain Springs. The first Mountain Deux was held in 2014, to celebrate the completion of the new saltwater pool at Mountain Springs. Both the pool and Land Trust of North Alabama are thankful for the four years of support that were given to this event.